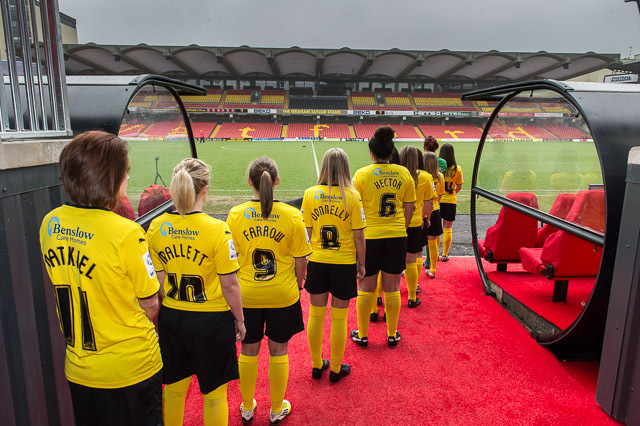 While Watford Ladies fell to a 4-1 defeat to Aston Villa, it was a remarkable day for the club. Cheered on by a fantastic record crowd of 1102, the Golden Girls struck first thanks to Megan Wynne’s seventh minute effort. Villa were clinical and took their chances, with goals from Katie Wilkinson, Kerri Welsh and an Alicia Robinson double. With tremendous noise coming from the Sir Elton John stand, Watford made the dream start, taking the lead early on. Hollie Wride’s first corner was well dealt with at the near post but her second was perfect, it found Wynne who then placed it past the opposition defenders on the line, giving the Lady Hornets a 1-0 lead. Buoyed on by the opening goal, the yellows looked like doubling their lead. Good build-up ended with Kate Natkiel trying an audacious lob from 25-yards out, it narrowly missed, landing on top of the net. Unfortunately, the hosts were forced into a change shortly after. Chloe Gunn had picked up a knock from an earlier corner and had to be taken off. Jenna Dear came on for her debut and was in the thick of the action straight away, almost finishing a superb passing move. Shortly after, the Lady Villains equalised. Alicia Robinson’s central free-kick was headed home by Kerri Welsh into the bottom right hand corner, leaving Shayla Burgess with no chance. Watford weren’t deterred and still looked like finding a second. A lovely through ball from Stacie Donnelly sent Anneka Nuttall through one-on-one, however Leach denied the striker well. It was end-to-end action and only a minute later, Villa took the lead. There was nothing anyone in a yellow shirt could do as Robinson unleashed a cracking strike from 25-yards out. The opening half hour had been a fantastic advert for both WSL2 and Watford Ladies, with the game well in the balance, until a crucial decision then went against the hosts. Shayla Burgess was adjudged to have brought down Olivia Fergusson in the box although it appeared that the keeper had managed to get the ball. Wilkinson made no mistake from the spot, placing her penalty right into the corner of the left hand side. It was most certainly a harsh scoreline and it got even harsher only a minute later, as Robinson got her second of the afternoon. While the second half began with the team facing a three goal deficit to overturn, the backing of the crowd didn’t stop throughout. Shayla Burgess again had barely put a foot wrong and she showed her worth just before the hour, superbly pushing away Fergusson’s header from close range, Wride then did the rest. The second half saw a battling performance from Watford, with plenty of possession in the attacking third as they looked to find a way back into the game. While this pressure was taking place, the attendance of 1,102 was announced over the PA system, to large cheers from the equally large crowd. On as a substitute, Dawn Mallett tested Leach with a free-kick from the angle but the Villa goalkeeper saved well. Even in the latter stages, everyone kept plugging away, Nuttall sent a brilliant ball into the area but no one could get on the end of it. The full-time whistle eventually went after more than five minutes of stoppage time. An end to a historic football match but not the end of the progression on and off the pitch for Watford LFC.